Made by the same guy who made the Jagstang. Is cool. $11,000. This is a rare guitar and a historic piece as Courtney and Bonnie Raitt were the fist two women to have fully custom guitars built for them from the custom shop. It was built by Mr. Larry Brooks (one of the first at the Fender Custom Shop, and the head of Fender Artist relations). His builds are simply the best. 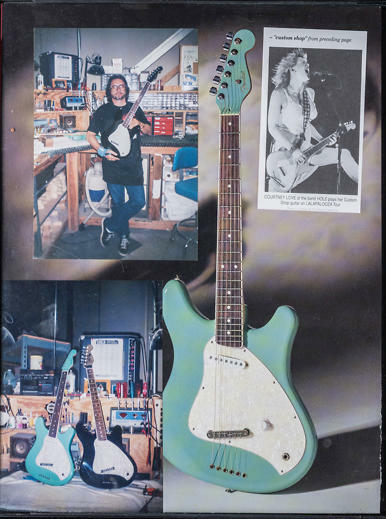 Before this project with Courtney, he worked with Kurt Cobain to build the Fender Jag-Stang. "Regarding Courtney Love�s guitar: I was the Artist Relations Builder at Fender during the 90�s when I built/designed this guitar, serial number CN402003. It was owned and played by Courtney Love. I worked closely with her to build this prototype. It was 1 of 3 guitars that were built for her during that time period. Fender model �Venus� is what ensued. 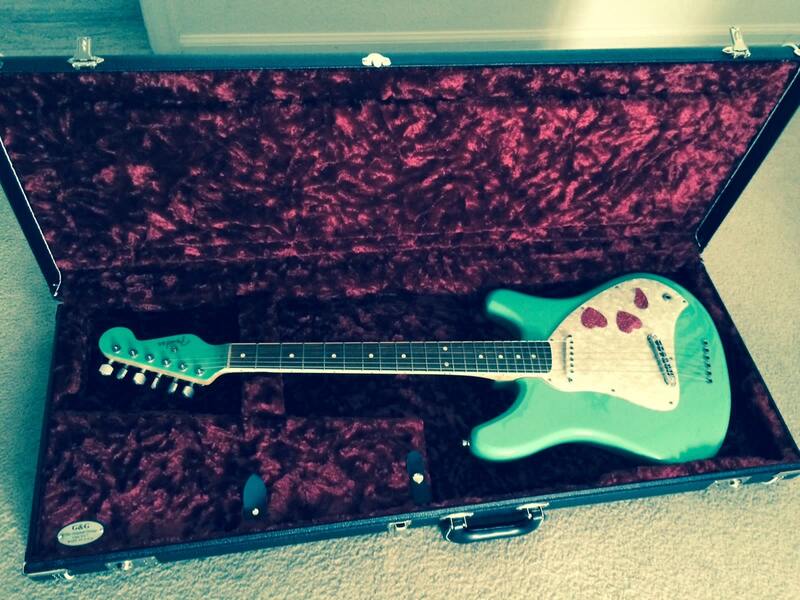 Courtney played this guitar during many of her shows, including Lollapalooza (see photo). During one show the guitar was dropped/broken and someone, presumably her guitar tech, re-glued the headstock. The guitar has been left as it was when it came to me. I designed this ballsy-toned guitar to include many custom aspects, like the bound custom shaped neck, matching painted headstock, absence of a volume knob, custom shape pick-guard, custom body shape, and strings that flare over the tune-o-matic bridge through the body. I designed the custom body shape. At the request of Courtney�s manager, a volume knob was left out of the build because she apparently would keep turning it up louder and louder. I used Fender U.S.A. Custom Shop decals with my name on it for artist guitars. There is one on Courtney�s guitar underneath the finish on the back of the headstock." The guitar will be sent in it's custom G&G case. It even has the last strings on it that were played by C.L. It also has all of the original pick scratches and other elements from her playing. Pretty cool! The signed Larry Brooks letter is included, and Larry has offered the new owner his time to discuss this guitar and stories that go with it. Love the Venus though. Gonna look for one on eBay now. Good luck. They don't come up that often. I keep meaning to pick up a green one to go with my black XII but they don't come up very often and when they do it's always been the wrong time for me. Have always liked the (Sonic?) Blue custom shop one she had too. Yeah with tort guard and Duncan Lil '59, that one was coo. I want a Mercury Guitar, the company she ripped the design off from. The Mercury guitar guy/guys were active on offsetguitars.com a while back, a forum member even sent them one of their guitars back to them to use to make new ones. They found bodies, etc. Were giving updates, and then kind of faded away. I was REALLY eager to get one, so I email him, and he told me he was going though some heavy personal problems... If I had any luthiery skills whatsoever I would make some. 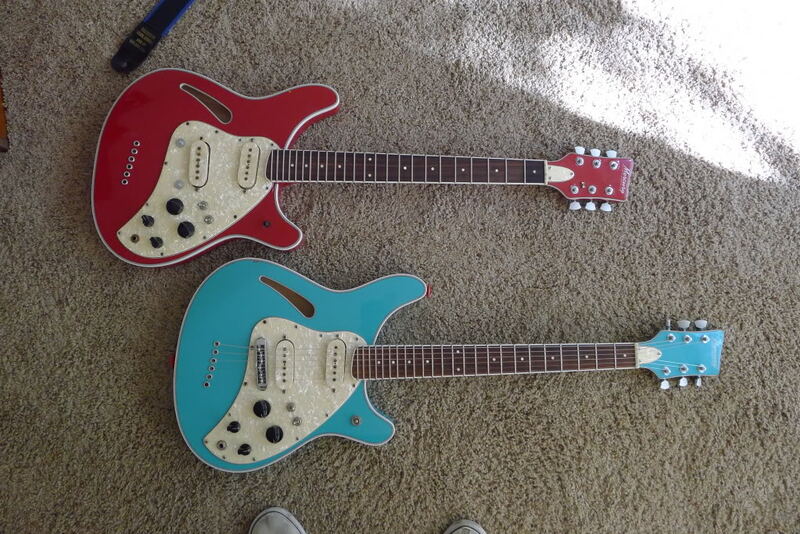 Awesome looking guitars. On the fender, I don't get the sharp angle of the bridge, unless the string guides are also slotted at an angle....seems like it'd have tuning/string snapping problems by design.